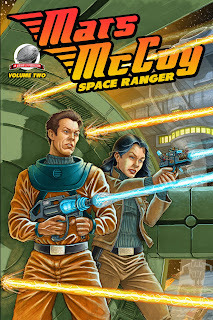 Airship 27 Productions is proud to present the second in our exciting space opera series featuring Captain Mars McCoy, Space Ranger. When the universe is imperiled, the call goes out to the brave men, women and robots of the Space Rangers; a group of highly skilled pilot/warriors dedicated to the preservation of law and order throughout the known worlds. Headquartered in the hidden free-floating asteroid station known as the Black Hole, the Space Rangers are ready to respond to any threat traveling the space lanes in their ultra-fast and powerful Black Bird patrol ships. In this second volume, Captain Mars McCoy, and his gorgeous co-pilot, android Lt. Betty-12 of Black Bird 5 confront two unique and malevolent threats. In “The Curse of the Star Lance,” by James Palmer, they discover a lost Imperial Space Cruiser and the hidden horror that still dwells within it. Next up is Van Allen Plexico novella length adventure, “Mars McCoy and the Chaos Horde.” A mysterious army of monsters begins materializing at random throughout the Fringe worlds wreaking chaos in their path. What is their secret origin and how can Mars & Betty-12 put an end to their lethal rampage? This second volume features a stunning painted cover by Michael Youngblood with interiors by Shannon Hall, designs by Art Directory Rob Davis and edited by Ron Fortier. Cast in the mold of classic pulp sci-fi heroes ala Flash Gordon and Buck Rogers, Mars McCoy Space Ranger blasts off once more for brand new outer space adventures jammed packed with galaxy spanning suspense and thrills.